“To the children in The Third World; Tanzania, Rwanda, Burundi, Somalia, Congo and etc, who can’t enjoy football freely because of poverty, war and natural disaster, having a football means a lot and can be a dream and hope to escape from their poor life. However, the children are so poor that they can not buy a football. So, they play football with the ball made of plastic bag or coconut palm leaves, therefore giving them their own footballs which can give them hope. This is our aim for this project. 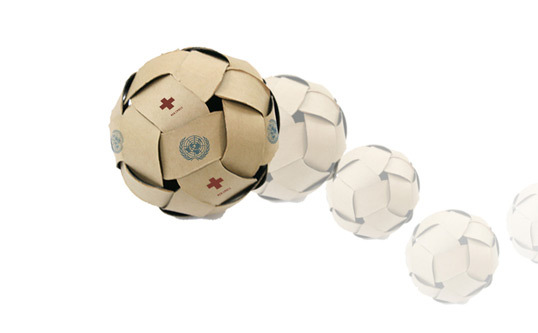 We suggest this Dream Ball made of relief boxes delivered to those poor children by recycling. A. Create patterns that can help making a ball on the surface of an aid box. Nice idea, but it’s the wrong shape. Great idea! How are the pieces actually woven, and the ends attached? I don’t see a picture of a ball on the packaging. I would think that would be useful in guiding them to the instructions and proper opening of the packaging. Again, what a great idea! I hope it is used a lot. 1. what size cylinder is required for a life-size soccer ball to be re-constructed? 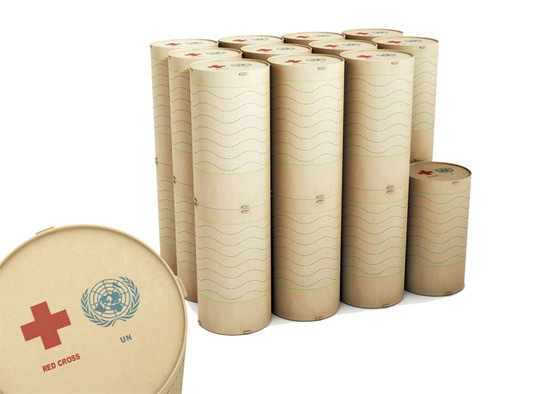 2. are the cylinders available for retail purchase? It’s a really inspiring design! Interesting and great job. 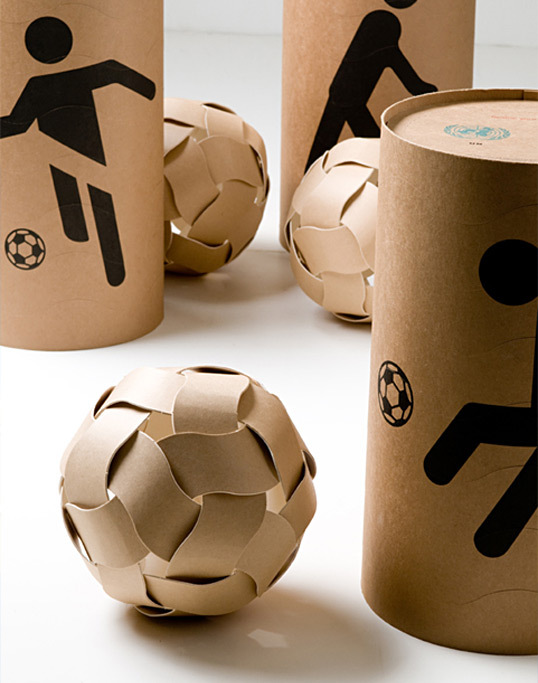 I bet the third world children will love this simple cardboard ball. how can i find out the product process?? Interesting concept, but I don’t think this material can resist two matches. Also, those children deserve real soccer balls, just like any rich children in the rest of the world. Creative use of paper. I’m not sure if the balls are strong enough for playing, but they are sure funny! As a soccer ball this makes a great puzzle game. This projects concept sure is “cute”, but it seems to me that it was very superficially thought out. Atrocious. Seems like they were more interested in winning a design award instead of finding a real way to make a difference. Reminds me of a real good essay about “designing as a tourist” and the results of good intentions meeting with reality. I have been on numerous outreach projects into third world countries including Botswana, Zambia, Zimbabwe and Mozambique (I live in South Africa, go figure) and I hate to break it to you, but this kite really won’t fly in Africa. I always make a point of it to take a few soccer balls with me to ease interaction with the local children (who are usually the best way to get to know the people of the community) and so I can leave something behind. Firstly, the people in these poor areas aren’t as pathetic as you may think. They aren’t so much hoping and praying for western saviors, they are simply trying to get by with what they have. And the children are particularly good at one thing: Obtaining soccer balls! And yes, as said before, this ball wouldn’t last 2 matches. Not that it’s an all bad idea though. This ball will keep kids happy for hours, and it is a by-product of a package that needs to be sent anyway, further offering help and humanitarian assistance. Take haiti for example, those affected children could be distracted by a ball and not focus on hunger and the stress of everything happening around them. I invented PromoPlanes, made them out of old printing jobs that would have been scrap, and gave them to kids at baseball games, those kids played with the basic printed paper airplanes for hours, and asked for more to take home, fold and play with. Everyone wins. We did a similar thing with a now active product EnviroCoasters.com, using PCW to make drink coasters, instead of using virgin paper pulp. I’ve been to Haiti. I’ve been to Africa. In both places and in the orphanges I have seen real soccer balls and balls made out of paper or trash, and they’re treated equally and offer a great way for the kids to play. Isn’t the real goal here to provide some kind of enjoyment for people who might not be able to get a real soccer ball, while at the same time providing a way for the aid packaging to be reused? It’s a brilliant idea, and one not deserving of the criticism I’ve read in the above comments. As to providing the soccer balls that the “rich children in the rest of the world” have, I guess it would be up to us to actually start sending/giving money so that can happen. got to agree with the sentiments of some of the commenters here. Not like the kids there deserve any less. A good rain or muddy field will destroy this ball in minutes…but good intentions, and creative use of material. I agree with Geo and others, the kids there would be no less disappointed than more privileged kids that the ball only lasted for 2 kicks before being destroyed. As a proof of concept though its great. it’s not a new design…the pattern of the ball is the same of “Taklor ball” in south east asia….you just add the concept in to it…. That’s cool, beautiful it looks though it is not much practical for play. That is a green product using recycle material so good idea any way! A very noble effort, they’ll be pleased to receive it. Can you explain in more detail how to make it? I think that would be stronger if the inside is filled with plastic or pads from used paper. great idea! I hope it is used a lot.